Valentine’s Day is right around the corner and that probably means you’ve found yourself scrambling to make some fun plans for the big day. You’ve been racking your brain for something unique to do (the whole dinner and movie thing has lost its luster), but you just can’t seem to think of anything creative. Not to worry. Use these 7 unique Valentine’s Day date ideas to help get your creative juices flowing. Don’t forget, Valentine’s Day takes a bit of planning. The date itself is a big piece of the pie, but have you thought about the Valentine’s day cards and gift? Oh, boy! Wouldn’t want to go through all that trouble planning the perfect Valentine’s Day date and not send a card in advance. Don’t worry, we’ve got you covered on that front too. 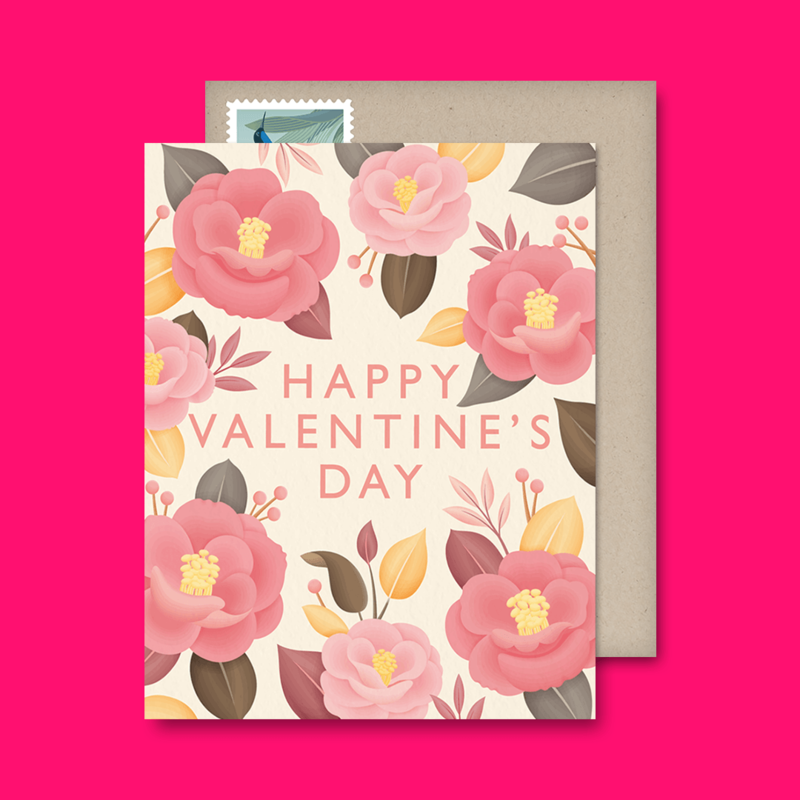 Postable has the most bewitching selection of Valentine’s Day cards out there and we’ll even mail the cards for you. Yup. No planning involved there. Just select the card you fancy, write a nice little message and click send. Postable takes care of the rest. We promised some unique ideas and we’ve delivered. Which one will you try? 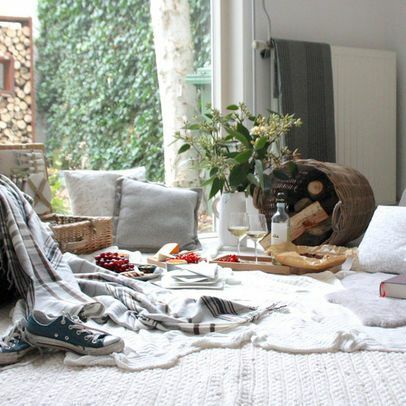 Get some tips from Houzz.com on how to set up a lovely indoor picnic like this one. A romantic indoor picnic is the perfect spin on the old fashioned dinner date. There’s something truly satisfying about slowly picking at delicious finger foods while sitting cross legged on the floor. It’s also the perfect excuse to feed each other all sorts of yummy things (chocolate covered strawberries anyone?). While Valentine’s Day is probably far too cold for most of us still experiencing the winter, a picnic is totally still doable indoors. Find a plush blanket and toss a nice sheet on top to make sitting on the floor feel similar to sitting on grass. Cover the sheet with an assortment of goodies, pop open a new bottle of wine and enjoy a night in. The benefit of having an indoor picnic (aside from the privacy) is the added bonus of being able to watch a movie! Check out your local venues to find a Valentine’s Day specific event. Restaurants aren’t the only businesses to throw Valentine’s Day date themed nights. Checkout museums, movie theaters and local botanical gardens. Often these will have a special after-hours events like this Romance Under the Stars event at the Natural History Museum in NYC or this Planet Obstacle night for the active couple in Orlando. You shouldn’t have any trouble finding unique valentine’s day date ideas if you just look to your local guides. 5. Go retro with skates. Find a local roller rink for a unique Valentine’s Day date. It’s likely that the two of you haven’t skated in years so it’ll be a date filled with laughs and the constant need to keep each other upright is the perfect excuse to stay close. A unique date for a low-pressure environment. The local roller rink will also probably have a fun Valentine’s Day theme going that night so it’ll be filled with other romantics like yourselves. You can also plan a part II of the evening with some wine (or coffee) somewhere with a more private setting. No, we don’t mean hitting the club on Valentine’s Day is a good idea. We’re talking about real dancing. So many options with this one! If you’re the kind of couple who love to go out, find a romantic restaurant or club with a live band. If you’re brave enough to hit a latin dance floor, find something nearby with a live salsa band and hit the town. The cool thing about dancing is it doesn’t have to be so complicated. You could even revamp your living room or your back porch into a dance floor — move the furniture, light some candles and put on some romantic tunes. Make it even more interesting by getting dressed up. Put on that sparkly gown and pretend you’re at a ball with your one and only. Or if you’re lucky enough to live in a warm-ish climate, hit the park. Hire a guitarist for an hour or so to play some lovely tunes, prepare a simple picnic and take your partner dancing – outside. Doesn’t get more romantic. Remember you don’t have to have fancy feet. Just move and enjoy the moment. 4. Dinner and a movie with a twist. Going out to eat is fun and all, but if you’re looking for something a bit more exciting for your Valentine’s Day date this year, how about cooking together. If you two are chefs extraordinaire, then by all means make plans to cook up something intricate. On the other hand, if the only time you find yourselves in the kitchen is to heat up last night’s left overs — keep it simple. Make your own pizza for example. Buy ready-to-go pizza dough at your grocery store and pick out your favorite toppings. Then have fun compiling your pizza together and don’t worry if it looks a little funny, it’ll still taste good! Pair your homemade pizza with a movie both of you would enjoy and don’t forget about the dessert (and wine). For the couple who enjoys a good poem or has their top 5 literary favorites ready to go at any given moment, a romantic reading may be the way to go. Hit the library and find your favorite romantic novels and poems to take turns reading them aloud to one another. If the library is closed for the night, consider hitting your local book store to pick out your favorite love stories for each other’s Valentine’s Day gifts. Find a nearby wine bar and spend the evening reading each other excerpts from the new books. 7. No dinner, just dessert please. Have some unique Valentine’s Day date ideas of your own you’d like to share? Tell us what you’ve got cookin’ in the comments!